Continue on Kramer Road 0.8 miles and bear left at its intersection with Raccoon Creek Rd. Continue 1/4 mile to the intersection with Knowlton Hill Rd, where we will meet. Everyone is welcome, including non-members. Trips last 3 to 4 hours but one can leave at any time. For questions, call the field trip leader, Loree Speedy at (724) 872-5232/home; (724) 518-6022/cell or loreespeedy@gmail.com. 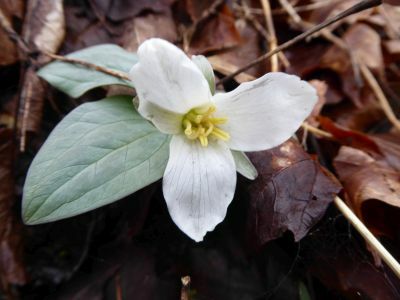 This is a favorite trip for early spring ephemerals and Snow Trillium (Trillium nivale). The walk is easy along an old railroad grade. Directions: Take the PA Turnpike to Exit 67-Route 30/Irwin/Greensburg. Take the Route 30 East/Greensburg ramp. At the first stoplight on Route 30, turn right onto Arona Road, then another right after 0.5 mile onto unmarked Wendel Road. Travel this road 3.7 miles to a T. Turn right at the T and continue 1 mile to Herminie to a 4-way stop (VFD on corner). Continue straight to the next stop sign and turn left. Proceed through 2 more stop signs, end at a T, and turn right. Continue past the Dairy Queen on your right and continue down a hill; we will meet just before the highway bridge. Park on the left side. These directions are difficult as roads are unmarked and state roads through Herminie sometimes look like alleys. If you can use them, the GPS coordinates will likely take you by a more direct route. GPS coordinates: 40.26050, -79.72700.